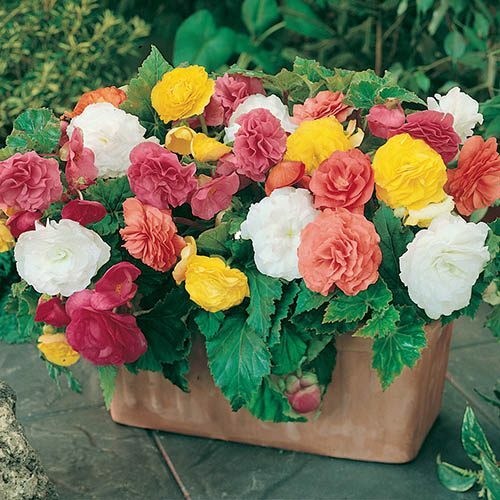 Incredible Belgian Begonias - the best Begonia displays you'll ever grow! Massive 6 blooms from early July to late autumn. Flowers stand up even when heavy with rain! Dazzling array of spectacular colours, perfect for cut flower displays in a vase indoors! They'll bring your beds and borders to life! Supplied as 10 extra large corms for bigger, better displays. Ready to plant. Brighten your summer hanging baskets and patio displays with these fantastic Upright Giant Begonias. These exclusive Giant Belgian Begonias are highly sought after because of their incredible 6 inch (15cm) diameter giant blooms and dazzling variety of colours, supported by stronger stems for weather tolerance too. Bred by the renowned Arnold van Peteghem at his nursery in Ghent, Belgium, the European capital of Begonias, Arnold has spent his whole life developing and growing these incredible hybrids. The impressive flowers are produced in great volume all summer long. It has a gently cascading habit so the display will be globe shaped and your hanging basket or patio tub will be covered in flower through 360 degrees a truly eye-catching display! Begonias are undergoing a resurgence in popularity in recent years, as they perform Summer after Summer - whether it's hot and dry, or our more usual wet and windy! We've been lucky enough to obtain tubers much larger than those currently available eslewhere (due to last year's hot weather) which means they'll produce an even bigger and more impressive display. You Garden have been lucky enough to obtain a limited number of these tubers so dont miss this one-off opportunity to obtain some for yourself and at a very special price! Supplied as Jumbo Tubers (5cm+ diameter) for bigger flowers, ready to plant.